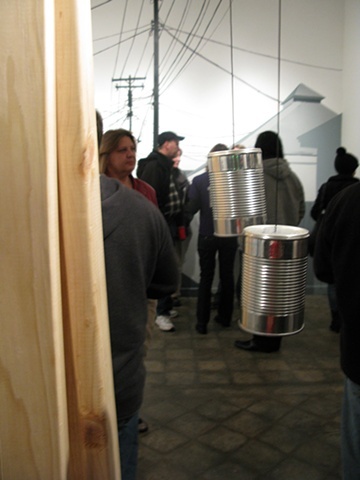 Detail from "In Your Neighborhood"
Tin Cans hold the plethora of ambient sounds of the neighborhood of Hamtramck. Hamtramck, a traditionally heavily Polish Catholic neighborhood is also the only city in the states to have an islamic public call to prayer and the sounds of mosques can be heard mixing with church bells, car alarms, trains, ice cream trucks and barking dogs of the city. Each can houses one sound in it at a time. Here you can here how both cans would sound if you held them up to your ears at once...mixing sounds and meanings.